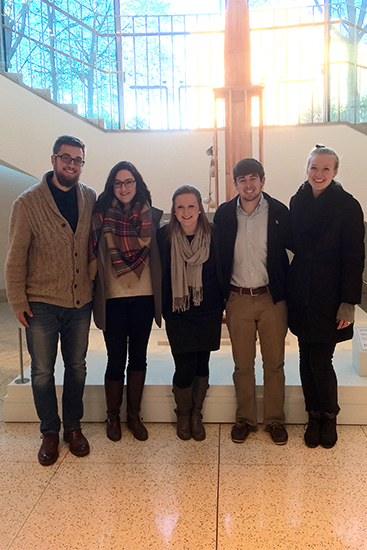 Students in Samford University’s journalism and mass communications department received an honorable mention for their entry in the 2015 Bateman Case Study Competition sponsored by the Public Relations Student Society of America. Schools from across the U.S. participate in this annual event, held every year since 1973, to assemble the most successful public relations campaign. This year, 60 schools entered the event. While this was just the second year Samford competed, the team placed in the top 16 nationally in addition to receiving an honorable mention. The Samford campaign entry was organized by public relations majors Bailey Fuqua, Cameron Cross, Taylor Pigman, Corey Mulligan and Cassady Weldon. The team worked with Neighborhood Housing Services of Birmingham, a local affiliate of Home Matters.